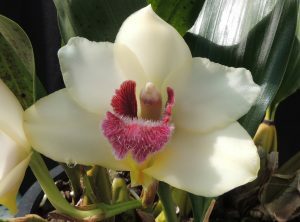 Our Cool Americas section is once again filled with the divine scent of Bifrenaria harrisoniae. 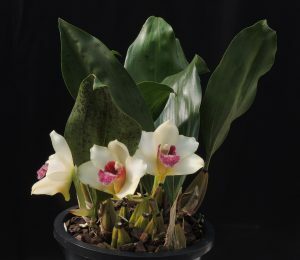 The thick waxy flowers are long lasting if kept dry and if you are into scented plants this is a must have species. We are pleased to say we have lots of seedlings in flask with the first now ready for sale. 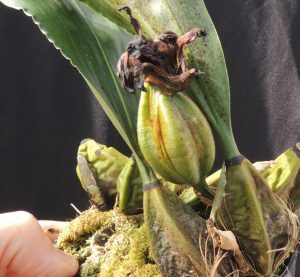 Interestingly the seedpod from the flowers we pollinated last year split on Monday (below) showing that the pod takes precisely 12 months to mature. The species is native to the Mata Atlantica, Brazil, and in 2001 our expedition came across it growing on a bare granite mountain side West of Nova Friburgo. 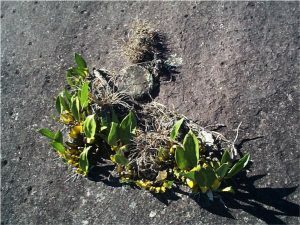 As the photo shows, plants are growing in full sun with their roots holding firmly to the rock and very little around the plant to retain moisture. This rock was dry in the winter when we visited but would be running with water for much of the wet summer season. After seeing the plant in the wild we adjusted our growing of the species to give more light but keep cool temperatures (the altitude was around 1000m) and we grow plants in the unshaded south facing doorway of the Cool Americas section. The habitat also sheds light on the why the species choses April both to flower and release seed. In April the climate here is still dry meaning that flowers will remain undamaged until pollinated and seed released now will be able to blow across the dry habitat. In a months time their will be heavy rains, providing water for the new growths, the maturing seed pods and the germinating seedlings.